Stainless steel cookware is favored by professional chefs not only for its beauty and luster, but because of its durability and even heat distribution. In addition, stainless steel is low maintenance and can be cleaned in the dishwasher, although hand washing is recommended. Although stainless steel can withstand high temperatures, prolonged exposure to high heat can result in a process known as "rainbowing," a blue or brown discoloration on the surface. 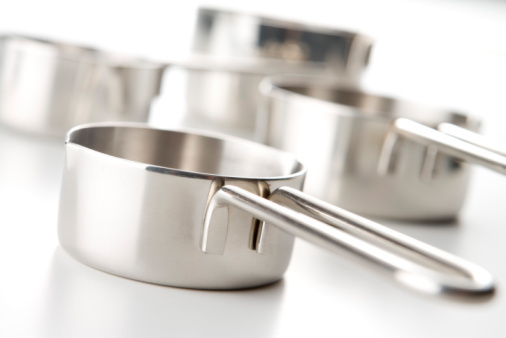 High-quality stainless steel cookware is easy to maintain. Pour dish-washing liquid onto the nylon pad. Add warm water to make the nylon pad soapy. Scrub the blue stain in a circular motion with the soapy pad. Rinse with clear water and dry with a soft cloth. Hard water can leave water spots on stainless steel if left standing. Mix mild cleanser with warm water to make a paste. Apply the paste to the blue stain and scrub it away, using the nylon scrubber. Rinse with clear warm water and dry immediately with a soft cloth. Lee Weal began writing and editing online content as a corporate intranet administrator in 2000 and was also the publisher and editor of a monthly employee newsletter. Her articles specialize in children's issues and home improvement.